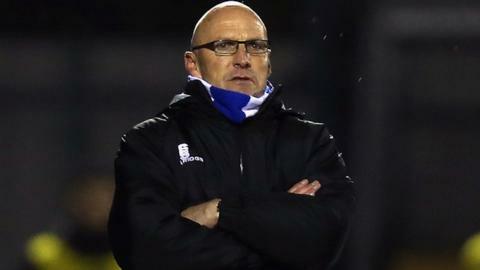 Chester manager Steve Burr has signed a two-year contract to stay at Bumpers Lane, despite City's relegation back to the Conference North. After coming in to replace Neil Young as boss in January, Burr failed to keep the Blues up in cruel circumstances. City shipped a late equaliser to draw 2-2 at home to Salisbury as, almost simultaneously, Hereford hit a late winner at Aldershot. But, despite being linked with moves elsewhere, Burr, 54, has opted to stay. The club announced the news at their end-of-season awards night at a Chester hotel, at which chairman Tony Durkin said that the club expect to turn in a small profit for the season and have done a feasibility study on developing a possible new training ground opposite the stadium on Bumpers Lane. "I am delighted to sign my new contract with Chester," said former Nuneaton Borough, Hucknall Town, Northwich Victoria, Stalybridge Celtic and Kidderminster Harriers boss Burr. "Despite the club's relegation I have, since my appointment earlier this year, built up a good relationship from the fans through to the board of directors. "Despite other offers, I feel that this is a fantastic opportunity for me. "The club have ambitious plans for the future and I will now be part of those plans. "Chester has both a city and a club to be proud of and I will do everything possible to achieve success." Jan 2014 - Sacked by Harriers, appointed by Chester. Chester had won three successive promotions to reach the fifth tier of English football following the demise of Chester City in February 2010. City, who now return to Conference North, which they won by a record margin a year ago, were one of the few Conference Premier clubs to operate with a part-time playing staff. Burr, sacked by Kidderminster Harriers on 7 January, was a contender for the vacancy at Shrewsbury Town when Graham Turner stepped down a fortnight later. Instead, he took the job at Chester until the end of the season and Mike Jackson was appointed at Shrewsbury. After successive sixth-place finishes in his first two full seasons at Aggborough, Burr guided the Harriers to second place in the 2012-13 campaign before losing out to Wrexham in the play-offs. He turned down an approach for the vacancy at Forest Green in November last year, choosing to remain with Harriers. However, despite holding League One Peterborough to a 0-0 FA Cup draw in his final match in charge, he was relieved of his duties, the club having won just one of their last five league matches, to be replaced by Andy Thorn.